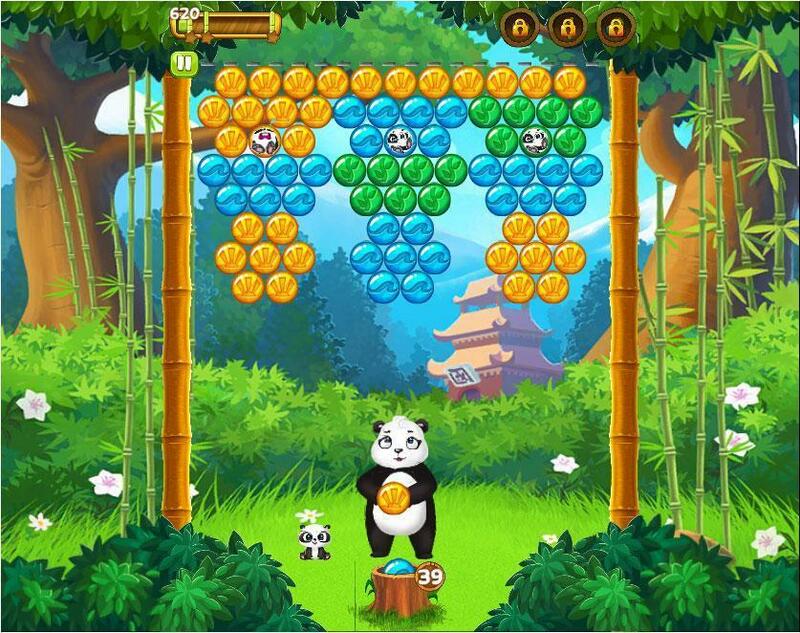 Panda Pop is a Free Facebook Bubble Shooter game, rescue the panda cubs from the bubbles and make sure they get safely back to mama panda. Shoot 3 or more bubbles to make them pop releasing the Pandas. Use special elemental lantern powers to blow up bubbles. Play over 90 levels of bubble action! The nasty Badboon has put all the panda cubs into balloons and sent them off towards the sky. It’s your job to throw bubbles up to catch them and bring them safely back to mama panda. Using the classic bubble shooter style you will be able to save these cute little cubs. By shooting the bubbles around the panda cubs you will be able to make them drop down. Removing any bubble that they are attached to will also make them drop, so if you blow up bubbles above them it will also release any pandas lower down. As you play you will open up coloured lanterns. These lanterns have a special elemental power when they are activated. To activate a lantern you need to pop bubbles of the same colour, the fire lantern needs red bubbles for example. When your lantern is full, click on it and the next bubble you throw will use the power, either fire blowing things up or roots climbing up and popping bubbles. Combining the lanterns together will make extra special powers, simply click on the lanterns you want to use before you throw the bubble. The red and green will then blow up lots of bubbles, and shoot up 3 roots together in a large area. These are especially good at removing stubborn bubbles. There are also 3 powerups that you can use, a rainbow bubble that changes to match the colour you shoot at. A super aim button for when you shoot bubbles off the wall. And finally the last one allows you to see the next 3 bubbles instead of 2. You can press the space bar to swap between bubbles, either when you have 2 or 3. You begin play with 3 of each of the powerups and when they have run out you can purchase them for real money. By clicking on the empty powerup you can pay instantly to use them. Each purchase will give you 1 powerup. 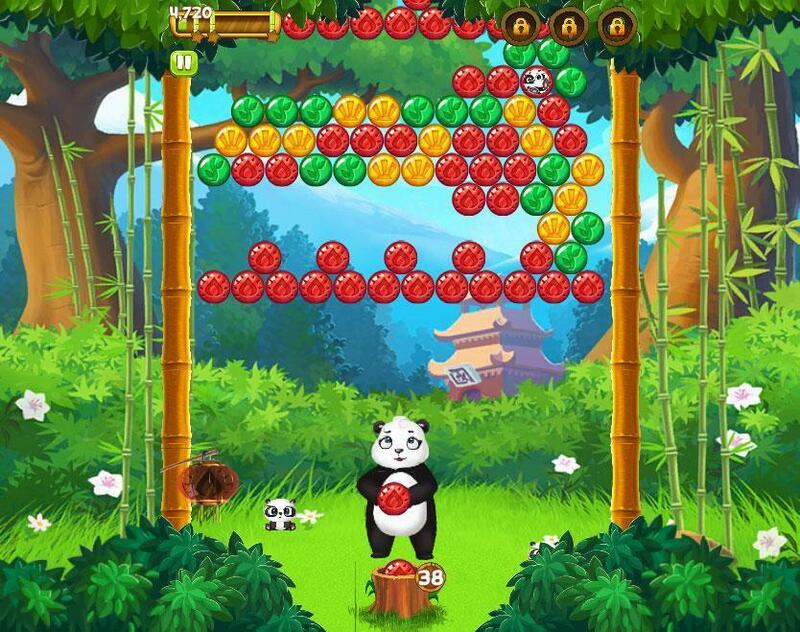 Panda Pop is a great and fun little bubble shooter, with some nice graphics, and especially cute panda cubs there is a lot going for it. While there are not a huge amount of boosters and powerups available, that adds to the game rather than takes away. The use of lanterns for special powers is really nice, especially when you combine the powers. 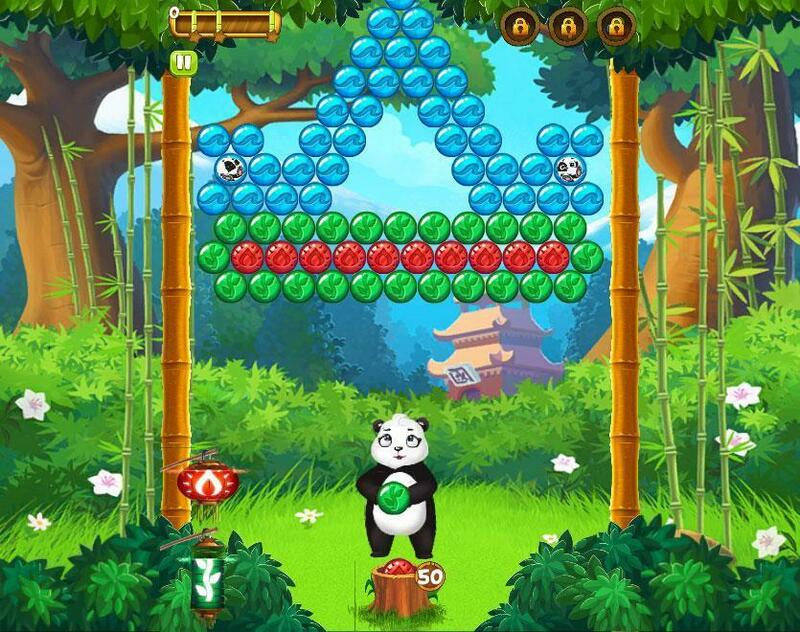 Although Panda Pop looks a little basic it is really engaging, and there are some great levels to play through. If you are looking for a fun and straightforward bubble shooter this is a fabulous game for you to try.